The Training Season will begin in October! 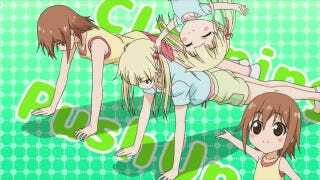 The Official website for the “Exercise with Cute Girls” Anime, Anime De Training! EX has announced that a second season is coming called “Anime De Training! EXX”. The history is about 5 girls who aim to ebcome Idols...SO they will do some exercise in order to be in shape, or something. This Season will have a new Girl (besides the other 5) Eri Suzuki.